The difference between MODEL I through MODEL VI is between $800 and $3,000 for models shown. The difference in tone was subtle from model to model, the difference in the touch is noticeable between the BA$E and models IV, V and VI, the biggest difference was in furniture styling and finish. An important consideration is the amount of dealer preparation the instrument is even placed on the showroom floor. This can add as much as $300 to the price of the piano, worth the cost and will add years of use to the instrument. 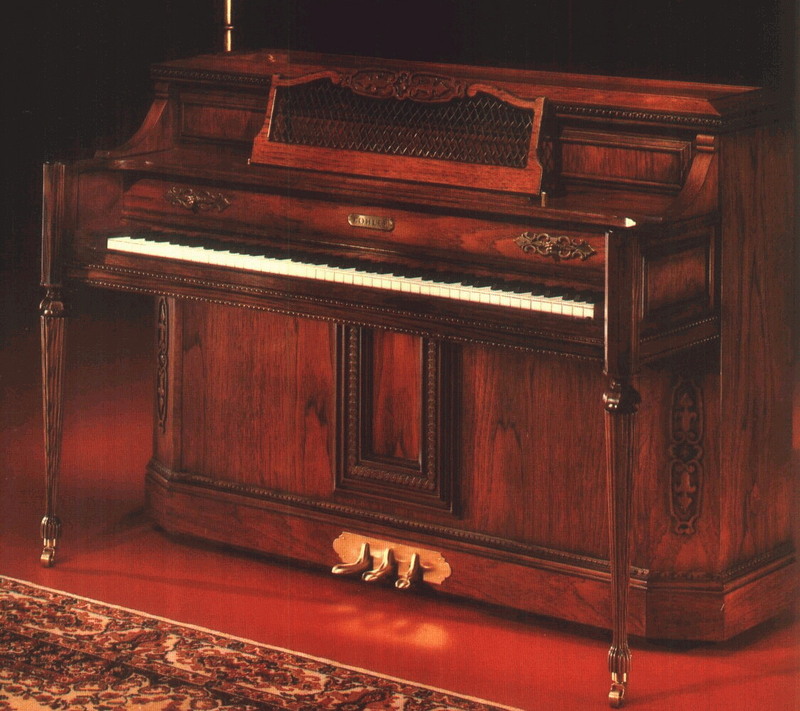 The important difference between these pianos is the amount of time spent in assembling the various parts into the case and bringing individual instruments up to their final tone quality. Pianos manufactured in this traditional manner may take from nine months to a year to put on the finishing touches. New verticals will of this kind generally run about $3000 more depending on the style and finish. MAKE: - Designates the brand name on the fallboard (key cover) or plate of the piano. Does not always identify manufacturer; you should request that information. SERIES - Designates a model number to identify piano. Some manufacturers use the size in inches or meters of a particular series as a "model" number. SIZE/TYPE: - This column designates the height of a vertical piano and the length of a grand. BA$E PRICE - Designates the "BA$E" price; the lowest retail price in a series. AVERAGE - Average U.S. selling price, Fair Market Value. RESIDUAL - Residual prices are for recent used models. In many cases dealers still have inventory remaining from recent years, that are either unsold new pianos used in teaching studios, schools, college/university programs. There are also a pianos that are leased or rented for short periods of time. The age of a particular instrument is not nearly as important as the condition, grade or construction. This information is intended for use in public libraries and educational institutions to inform the buying public of accurate prices and value. The age of your piano is determined by the serial number. You may look it up at Ages of Pianos. "THE E BOOK" FOR USED PIANO PRICES"